How can one get a Marti report on a Pantera? I tried, but it asks for more digits than a Pantera serial number has. Mine is THPNMA02986. I haven't got a Marti Report yet, but just a guess, try adding 874 in front of the VIN. Fairly sure Marti report is based on the 17 digit that requires a check digit. This requires a formula to calculate the correct check digit. Don't think the standard old school numbering system will not work in this case. I just looked at Marti's website. After selecting "Pantera", it asks for an eleven digit VIN. I entered my Pantera's eleven digit VIN, added it to the cart, and proceeded to check out. Not sure what happened with your attempt. Note that when asking for the VIN, there is a statement that says that if you have a car, your VIN should start with a number; if a truck, it starts with a letter. That statement doesn't appear to apply to a Pantera. Morning. Try calling Kevin Marti directly. They've made numerous reports for me over the years. Keep in mind they do NOT have EVERY [U.S.] Pantera in their files. From my experience, they have about 80%. That being said, don't be surprised if your vin does not come up in his Ford records. Also check the report for accuracy. 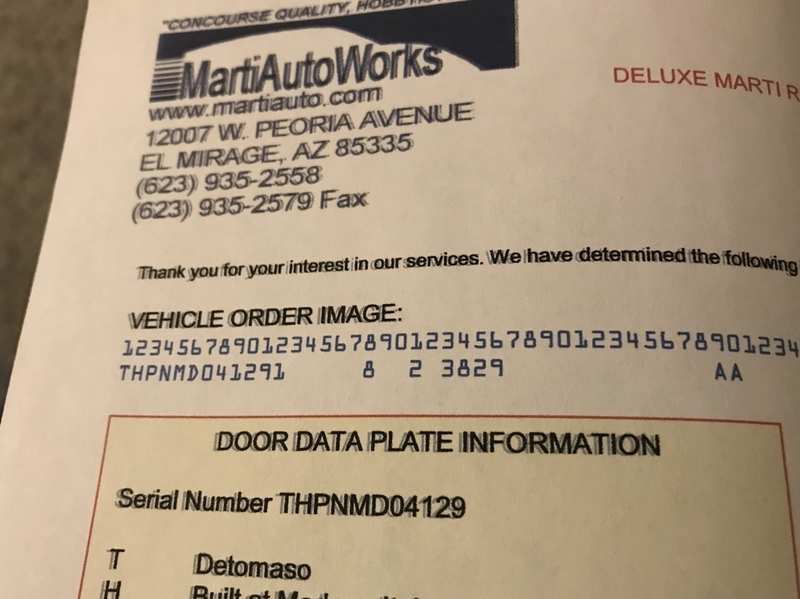 Frequently the production date on your door tag will not match the reports production date. Thank you for the information. I am the second owner of my Pantera with 40 years of fun, and think I know the first owner's history very well. However, surprises might surface. I've had the engine rebuilt and tweaked by others, but replaced or upgraded everything that needed it by myself. So Marti history might be scant. It should be fun to look anyway. It basically is going to tell you who the original selling dealer was and the original color. There is no other variation on a US car. In the case of the '74's retitled by Ford as '73's, that may show if your car was originally sold in California and was built as a '74 model. I'm not sure where Marti is getting all of his information from. I know that in the case of the '67 Shelby's, SAAC has supplied him with information, not Ford. Some years ago I was talking to someone at a meet who said that their father worked for Ford and was responsible for the warranty claims on the Panteras. He said that information was kept on 3x5 index cards hand written. I should have kept his name and phone number. The significance of it didn't occur to me at the time.